Once upon a time in a land much like this one there was a moth. It was a GREAT Grey Moth, just sitting on the sidewalk in the pouring rain. I picked him up, looked into his great big moth eyes, and fell in love. He died a week later. To this day, he sits on my pickup's dash, a furry skeletal reminder of the love we once shared. I'll let that one moth off. He sounds quite nice. 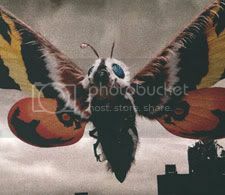 A great moth, named Mothra, once fought an epic battle with the mighty Godzilla. I love large furry moths and think they are quite beautiful. 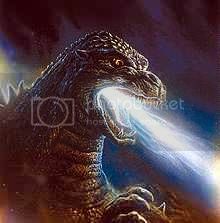 I also like Godzilla, particularly the old black and white movies, but the new one is also good fun. Have anyone caught a lizard and a moth, and let them fight a miniture Gozilla vs Mothra? Which one do you think will win? Will the lizard blinded by the moth dust or will it eat the moth? I'm thinking that the lizard would just eat the moth. In fact, many lizards do eat moths every day. I made that part up. Unless mathnerd did in fact know that... he's not lying, its merely a coincidence. If so, it means, ironically, that you are lying Tub if not, your telling the truth. And thus justice is served by a moth on the brain.